Sorry for the lack of post yesterday was up at the crack of dawn to a antiques market. I have become a little obsessed about rugs and how they utterly transform a space by tying all the different pieces together and adding a huge dose of pizazz. For years I have had bare floors – concrete on the lower ground floor and wood everywhere else apart from stone in the bathroom that is.Â I’ve wanted to soften it all up a bit and rugs are the simplest way of doing just that. At the market I happened to come across a teeny tiny rug a kelim actually that now sits in my basement and adds a beautiful yet subtle layer of texture to the space. 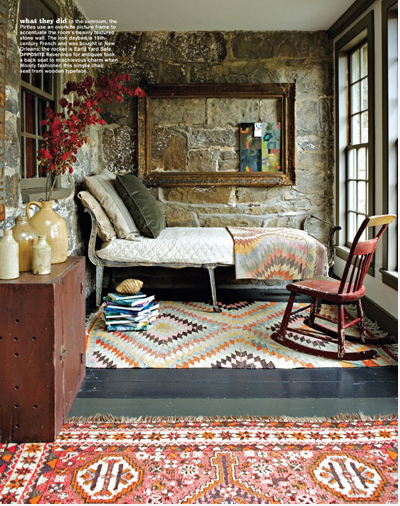 So some tips if you are thinking about decorating with rugs to help you along the way. If you are using more than one rug in the same area make sure they are not the same size not only would it cut your room in half visually its super boring. Also mix them up in my basement I have a woolen zeebra rug from Adler a circular bird rug from Anthropologie and now my latest addition an old softly worn rectangular kelim.